I’m a fan of Alan Pardew. I love how confident he can come across, how behind the team he is and how much he genuinely seems to understand what football means to this club and the city. Last year he scooped up all the accolades, the top prizes flooded in after guiding us to fifth; he has proved his managerial credentials, no doubt. The fact remains though, we’ve been poor all season. Nothing short of abysmal at times. What I can’t stand the most though is the same, repeated mistakes that let us down, week in, week out. Mistakes made by Pardew which should have been rectified by now. In last night’s game against Fulham we performed far better than games like Stoke away or Swansea, or West Ham at home, which all ended in defeats. We showed attacking intent and could have taken some points for sure but we ultimately ended with nothing, again. Leaving empty handed and wondering where did it all go wrong this time? Pardew must shoulder a lot of this blame. I’m not looking for a scapegoat or running out to make a ‘Pardew Out’ banner but I do want the man to recognise where he, repeatedly, goes wrong. The single biggest bone to pick I have with Pards is the unchallenged inclusion of Jonas. Gutierrez in the past three months has offered nothing to the side. Ok, you know he’s going to work his backside off for you but his contribution going forward, as a winger should, is absolutely non existent. I don’t care if he wins 100 free-kicks in a game, he’s past his sell by date. How on Earth though is his place consistently guaranteed?! Marveaux should have started the game but Jonas is his vice captain, he’s a favourite of the old Silver Fox’s and it looks like he’s untouchable. He should be though, he should be dropped. Again, I don’t want such a club servant and good squad player tossed on the rubbish heap but he hasn’t performed and this needs addressing. It’s gone on too long. 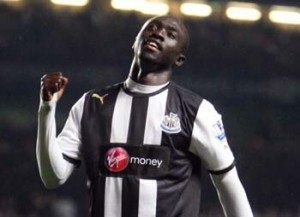 Cisse is an instinctive goalscorer, a poacher who is best in and around the box, looking to nick a goal for you. We saw this last season, 13 goals in 12 games thank you very much! So why o why, is he continuously being forced to play on the wing or as a wide forward, where games simply pass him by? The equivalent would be AVB telling Defoe to play in Lennon’s position at Spurs, it wouldn’t happen. It’s ridiculous in fact. We have seen it so much this season where Cisse has been a passenger. His workrate is there, it’s not his fault. He’s being used incorrectly and Pardew must account for this. Don’t worry, I haven’t forgotten it, there’s no shying away because we mixed it up last night. For the majority of the season it’s been like watching what would happen if Big Sam and Tony Pulis had a secret long ball love child, as we’ve seen more hoofball in Premier League gamesthis time around than we have in all the seasons I’ve watched us! Granted Cabaye isn’t in the side, yes Ben Arfa has missed games, but even without our most creative players, we should encourage a passing game the players are capable of producing. We have become long ball merchants. There’s no doubt, the evidence is there. Team selection, approach, inability to start a first half as well as a second, even an inability to come anywhere near close to scoring a corner! We are seeing repeated mistakes and no atonement for these errors. This week Pardew said we would be different, we were supposedly getting back to our best. However, this isn’t going to happen if we don’t change our mindset. Last night we made a start, the formation was a lot more positive but the personnel didn’t match. The next step should be to try Cisse in the middle again, with Ba going back on the left in a 4-3-3. If he isn’t happy then so be it. We need to bring the best out of the team. We are Newcastle United, not the Demba Ba Golden Boot Club. I have faith in players and of course I want Pardew to succeed. He is in charge of this team and must make decisions to better our fortunes, no matter how difficult those decisions may be. I feel like Bill Murray in Groundhog Day, please Alan show us something different and let me have my happy ending.